1- SLEEP! If you already have other children… good luck with this one. But, I would take as many naps as you can sneak in and go to bed early as often as you can. If you are like me, you are waddling around awkward and exhausted all day at this point and long for bed time the moment you wake up, so do what you have to do to get to bed early and rest up. You’re gonna need it! 3- If you have other children, spend as much one-on-one time with them as you can. Especially enjoy your youngest one whose world is about to be turned upside down. Watch them play. Play with them. Snuggle them. Soak in these last few days of experiencing them as your baby. With your older children, do fun things with them. Talk with them about the changes that are about to happen in your family and the new demands on your time. Ask for their help and let them be a part of the process of welcoming this new member of your family. 4- Take care of as many bills and paperwork items as you can in advance. If you have the luxury of having enough money in your bank account to pay a few bills ahead of time, it is so nice to not have to think about those kinds of things for the first couple of months as you are adjusting to your new schedule with your newborn. And to be honest, in your sleep deprived state and with the new demands on your time, it is easy to forget when things are due and overlook paying things. If you don’t have enough money to pay ahead of time and haven’t set up auto-pay for your bills, consider doing that instead. 5- Deep clean your house. You are probably already doing this, because it just feels like the natural thing to do right before having a baby for some reason. Make this a family project. You will most likely have little time or energy for doing anything but the bare minimum when it comes to house cleaning once the baby arrives, so give yourself the advantage of a clean house to start things off. In the process, you can sanitize the place and get rid of as many germs as possible before your new little friend arrives. 6- Get your hair cut, go to the dentist, get a pedicure, etc. I’ve actually never had a pedicure, but if there is anything you need or want done for your own personal health or appearance, do it now. It will be much harder once the baby arrives. 7- Stock your pantry and refrigerator. Going to the grocery store is not only overwhelming when you’ve just had a baby, but it also exposes you, and therefore your newborn, to all the germs that dwell there. Put off that first trip back to the grocery store as long as possible by stocking up before having your baby. 8- Go out with friends. Go on a girls’ night out or a group date with your husband and some friends. This probably won’t happen again for a while. 9- Advance shop for any gifts you will need. If birthdays, Christmas, showers, or weddings are going to take place in the two months following your baby’s arrival, go get whatever presents you will need in advance. While you are at it, pick up some thank you notes so you will have them on hand when people stop by with gifts or meals after your baby is born. 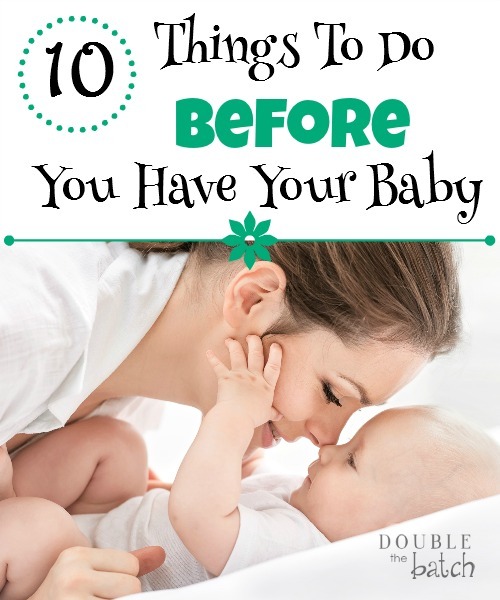 10- Enjoy the end of your pregnancy and the miracle of having this little life inside of you. Soon you will be able to breath again and you’ll be able to go longer than a half hour without running to the bathroom. You won’t feel every step you take and you will be able to find a comfortable position to sleep in. Stairs will not seem so daunting and you will stop eating tums like candy. But, being pregnant is a unique, amazing, and precious thing that not everyone gets to experience. Enjoy it until the last moment when that sweet little person is laid in your arms and your life is changed forever.